Billed as both a bonkers sound mangler and a subtle mastering device, can this little grey box really deliver on both counts? If history were anything to go by, you might have expected that the latest product to carry Elektron’s Analog banner would be a drum machine, a synth, a sample player or even an amazing pick-and-mix combination of all three — but how wrong you’d have been! In a somewhat surprising step, Elektron have released the Analog Heat, a powerful, hand-assembled, programmable, digitally controlled analogue stereo sound processor that the company bill as being both an audio enhancer and an audio destroyer — an intriguing combination, to say the least! Cosmetically, the Heat follows the paradigm set by all other members of the Analog line — a small back-lit LCD screen, a black-painted body, grey knobs and white legending, accompanied by an overall sense of quality courtesy of its all-steel casing and the smooth and positive operation of its controls. Although there are a fair number of knobs and switches on the Heat’s fascia, there’s plenty of space to contain them and, as a result, no feeling of congestion; operation is easy and swift. The only slight negative in this area is the use of a non-latching connector for the external 12V DC switch-mode power supply, and the absence of any mechanical method of securing the cable. Visually, the fascia divides into two horizontal halves, the upper of which (with two exceptions) carries the dark-grey knobs and switchcaps of the controls that enable you to recall one of the 127 possible presets, to access and adjust the operational parameters contained in the on-screen menus, and to save the results in one of the 127 preset locations. The lower half’s controls (and the upper half’s two exceptions — Active on/off and Master Volume) are light grey, reflecting their role in giving you physical access to the functions that most directly affect what you’ll hear at the Heat’s outputs. The Heat’s I/O connectors reside on its rear panel, where you’ll find TRS jacks for the stereo headphone output, the balanced stereo audio inputs and outputs, and a pair of control inputs to which you can connect footswitches, expression pedals or (using TS jacks) control voltages (CV). Three DIN connectors (MIDI In/Out/Thru) come next, with the Out and Thru ports capable of being configured as DIN24 or DIN48 Sync outputs. In addition to receiving and sending MIDI Clock and Program Change messages, the Heat can also accept Continuous Controller (CC) messages, opening up the possibilities of automation. 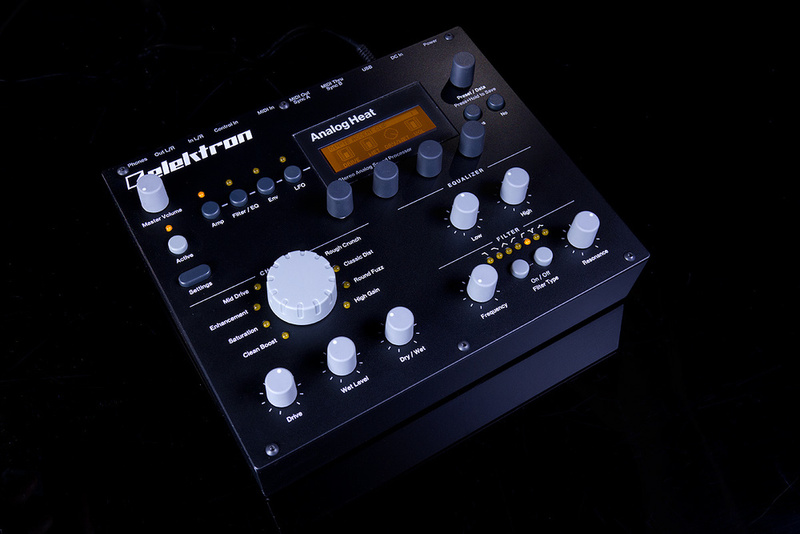 The final rear-panel connector is a USB port that, via Elektron’s Overbridge technology, allows you to integrate the Heat with your computer as a MIDI interface and 2 In/2 Out, 48kHz/24-bit audio interface. Overbridge also allows you to insert the Heat as a single-instance VST or AU plug-in. When inserted as a plug-in, a comprehensive graphical user interface (GUI) gives you full access to all of the Heat’s parameter controls and modifiers, and also allows you to configure it for Mid-Sides operation — more on that later. The Character section of the Analog Heat’s digitally controlled analogue sound-processing circuitry features eight different discrete stereo distortion circuits that deliver a range of distortion effects from a Clean Boost that eventually produces ‘old-school mixer’-type distortion, through Saturation and Enhancement, past Mid Drive, Rough Crunch and Classic Distortion to Round Fuzz and High Gain. This isn’t the linear progression that you’d get from, say, overdriving a tube guitar amplifier, but rather eight steps up a distortion ladder, each step having its own particular equalisation profile. This means that the Heat’s two-band High/Low EQ section responds differently for each chosen character. The rear panel of the Analog Heat hosts all the I/O, which includes a USB port for audio interfacing and plug-in remote control, MIDI In, Out and Thru and two voltage control inputs, alongside the audio connections.Each distortion type also reacts in its own way to the fully variable Drive control that, in combination with Wet Level and the Dry/Wet mix, gives you very fine control over the amount of distortion to be added to the original signal, be it for enhancement, thickening or simply for flat-out grind. Useful though the two-band EQ is, it’s the seven-mode analogue filter that lies at this processor’s heart. The filters available are one- and two-pole Low Pass (6 and 12 dB/octave respectively), a Band Pass, one- and two-pole High Pass (again, 6 and 12 dB/octave respectively), a Band Stop and a Peak — each with fully variable Frequency and Resonance. So far, so good, but we’ve only just started to scratch the surface; what I’ve described so far are only the aspects of the Analog Heat’s operation that can be controlled directly from the front panel. Still to come are the on-screen, menu-driven, programmable parameters that encompass all the foregoing and more. Before we get to those, there’s the on-screen menu (accessed via the Settings switch and the Preset/Data control) that contains not only system-level and global settings — input sensitivity, output level, internal tempo, control I/O, MIDI and USB setup and the like — but also the per-preset selection and programming of modulation sources, destinations and their levels, which can be either positive or negative. The Analog Heat arrives with 16 factory presets, the first eight of which are named after the distortion circuit that they showcase. Scrolling through these presets with the Preset/Data ‘turn to select/push to recall’ knob will let you hear some rather tasty exemplars of the Heat’s capabilities, after which point you’ll want to start experimenting. You can either modify an existing preset (recalling a preset also puts the Heat into edit mode) or recall the Initial Preset to start with a clean slate. The mechanics of editing, building and saving a preset are simple and intuitive. Four buttons to the left of the screen give you access to the available parameters for the Heat’s four operational blocks — Amp, Filter/EQ, Envelope and LFO. Four parameters, each with a dedicated data knob (push-switchable between fine and coarse resolutions) beneath the screen, can be displayed at a time, though those for the Filter/EQ, Envelope and LFO occupy two pages. Additionally, all the front-panel parameter controls can be used, alongside their corresponding data-entry knobs, when programming a preset. All parameters are displayed both graphically and in values that can range from 0 to 127 (or -127 to 127 in the case of negative/positive modulation), giving you the information to identify CC values where necessary. Since the active distortion circuit is selected only by the Character control, and has only three additional controls (Dry, Wet Level and Dry/Wet mix), the Amp block has space to display an additional parameter — Volume — that sets the output level of the programmed preset. The Filter/EQ block takes up two pages, with the first page displaying the cut-off frequency and resonance on a horizontal graph, and the level of modulation of the filter cut-off frequency by the Envelope and the LFO. The second page displays the Low and High EQ levels (-64 to +64) and gives you control of two additional filter parameters — Frequency Pan and Dirt. The Frequency Pan allows you to tilt the filter cutoff frequency between left and right channels so that lowering the cutoff frequency in the LH channel raises it in the RH channel, and vice versa. Dirt is essentially a pre-filter gain control, giving you the option of driving the filter into distortion. The two pages of the Envelope block are, for me at least, where things get really interesting. The Analog Heat contains an envelope follower function that uses the amplitude of the incoming audio to produce a control signal (envelope) that not only tracks those amplitude variations, but also increases or decreases with the overall volume level. Integrated with, and triggered by, the envelope follower is an envelope generator that produces either Attack/Delay or Attack/Release envelopes. Turning the first control on the first page of the Envelope block not only selects the Mode (FLW, AR or AD), but also adds a variable gain that comes in useful when generating an envelope or trigger signal from a weak input. ATK (attack time) comes next. In FLW mode, ATK sets the rise time of the envelope follower (ie. how quickly it responds to a change in amplitude), and in AR and AD modes, sets the attack time of the selected envelope. In these last two modes, the rise time of the envelope follower is set to its fastest possible value. REL (release), as in an envelope, follows ATK, and sets the fall time of the envelope follower and the release and decay times of the AR and AD modes. The final Page 1 parameter, TRG (trigger), sets the threshold level at which the envelope follower triggers the envelope generator and the LFO. The Base and Width parameters, which begin Page 2 of the Envelope block, correspond to the frequency range of the input signal that the envelope follower responds to, and can be configured to produce fully variable low-pass, band-pass or high-pass filters. The resulting envelope (follower, AR or AD) has three possible modulation destinations. One is a ‘hard-wired’ connection to the filter cut-off frequency, the depth of which is set in the Filter/EQ block menu. Two further destinations can be selected from the list of possibles shown in the Modulation Source and Destination box. Destination 1 and its modulation depth (negative or positive) are selected and set by the final two controls on Page 2 of the Envelope block, whilst the Destination 2 selector and associated depth control can be found on the Modulation page in the Settings menu. The final on-screen menu contains the LFO block. Wave, the third in the list of its four Page 1 parameters, controls the type of LFO waveform being generated — triangle, sine, square, sawtooth, exponential, ramp and random — and this is followed by Start, which sets where in the waveform generation begins (ie. the phase offset of the LFO). Now you have a picture of the possible waveforms in your head, I can explain that the LFO Speed control not only occupies the first position on Page 1 but also can be set to a positive or a negative value, the latter causing the wave to run backwards — this can give modulations using non-symmetrical waveforms a very different character. The final parameter on this page is the second-in-line Mult, which determines the multiplier (1, 2, 4, 8, 16, 32, 64, 128, 256, 512, 1k or 2k) to be applied to either the LFO speed set by the speed control or, in its bpm mode, to the internal tempo selected in the Settings menu, or to the tempo set by an external MIDI clock. This multiplier function means that you can run the LFO at audible frequencies (or above), which can lead to some great sonic effects. The LFO block has the same three modulation destinations and setting procedure as in the envelope block, and Page 2 carries the selector for Destination 1 and its Depth control. Of the remaining two parameter slots, Fade sets the fade-in rate of the LFO when negative and the fade-out rate when positive, with a zero setting resulting in no fade. The fade curve is reset each time the LFO triggers. The last section of the LFO block is the Mode function, which selects between five different LFO behaviours — Free, Trig, Hold, One and Half. Free, as its name implies, is free-running and continuous; Trig means that the LFO runs free, but is restarted when the envelope is triggered; Hold allows the LFO to run free but holds the instantaneous output level at the point that the envelope is triggered until the envelope is retriggered; One means that, when the envelope is triggered the LFO runs for one cycle and stops, giving it an envelope-like functionality; and Half is a half-cycle version of One. As you’ll have gathered by now, the Analog Heat is capable of some serious complexity — but I found it to be extremely intuitive to operate. When in stand-alone mode, as opposed to Overbridge mode, there are no readouts or pretty graphics to distract you and all that you’ll need to master the Analog Heat are your ears, your creativity, the odd bit of lateral thinking and, of course, your fingers. The first thing that struck me was the sheer quality of the sound that the Analog Heat produces. Elektron pitch the Analog Heat not only as a distortion-based effects processor, but also as a method of enhancing a track during the mastering process. I could find no reason to dispute their confidence in that latter regard, as I could see subtle application of the Saturation and Enhancement distortions adding weight and body. Alongside the EQ section’s ability to add clarity to the upper registers and warmth lower down, this could potentially be very useful when mastering tracks. As far as I’m aware, the combination in one unit of the eight possible distortions, multi-mode stereo filter, 2-band EQ and the extensive modulation potentials of the envelope follower/generator and LFO — not to mention the extensive editing options and the ability to store the results in 127 presets — is pretty much unique, and opens up an enormous range of sound-design and sound-sculpting possibilities. Although distorting drums, basses and guitars to within an inch of their sonic lives is unquestionably enjoyable, for my money, the real power of the Analog Heat lies in its multi-mode filter, and the extensive modulation capabilities and possibilities derived from its envelope follower/generator and LFO. Working with these — and this is a very tactile process on the Analog Heat — gives you the opportunity to sculpt beats, and to build rhythmic patterns dripping with constantly moving sonic textures, around an input signal that you can boost, enhance, crunch or distort to the edge of mayhem and beyond, as your inspiration dictates. Wondrous as all that power is, the Analog Heat is also capable of delivering an extremely nuanced and detailed performance because you can apply the envelope and LFO in both positive and negative amounts. For example, you could use the LFO’s ramp waveform running backwards in one-shot mode, triggered by the envelope follower and routed to the Drive parameter at a negative amount, to increase the amount of drive added to the original signal over the LFO cycle time. Simultaneously, you could route an AD envelope waveform to the cutoff frequency of the one-pole, 6dB/octave high-pass filter at a positive value, in order to reduce a portion of the high-frequency content in the distorted signal over the lifetime of the envelope. Adding to the Analog Heat’s flexibility and overall usefulness is its compatibility with Elektron’s Overbridge software for Mac (10.8 to 10.12) and Windows (Win7 SP1, 8 and 10.1). This free program integrates the Analog Heat with a computer as a 2 In/2 Out soundcard via its control panel and as a single-instance hardware plug-in (VST or AU). So, not only can you record through the Analog Heat straight into your DAW, but also you can use it to simultaneously process either another source entering your DAW or an already recorded track. Overbridge not only controls the Analog Heat, but can also route audio to and from it. Overbridge also contains a preset editor/librarian whose software controls communicate bi-directionally with the Analog Heat hardware, giving you the option of also using your DAW to automate and recall any control moves made in either hardware or software. The Overbridge preset editor makes creating or modifying a preset a much easier task, especially when it comes to assigning modulation destinations. There’s also one final trick up its sleeve, in that the preset editor also allows you to run the Analog Heat in Mid-Sides mode, with the restriction that you have to process Mid or Sides either in separate passes, or together as a pair, with the same settings on both. 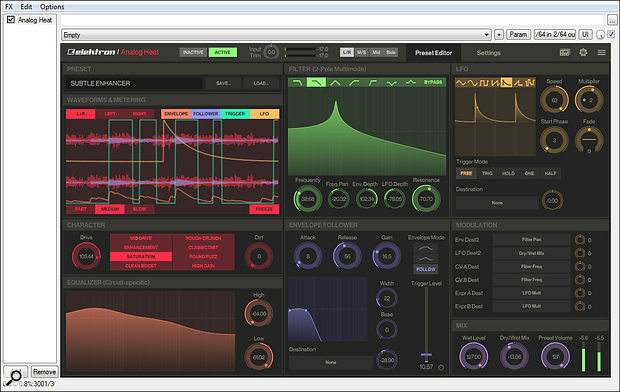 As you’ll see from the screenshot, the Overbridge preset editor interface is graphically rich, which does enhance the user experience by, for example, enabling you to visually check the interaction and timing relationships between audio waveforms, triggers and envelopes on its real-time display, giving you the option to make any adjustments either on screen or on the hardware itself. In addition to controlling the Analog Heat, Overbridge also provides a return route from a track in your DAW, out to the analogue hardware of the Analog Heat and back via a VST/AU plug-in. This plug-in has been designed to minimise the load on your computer’s CPU and, as a result, places a heavier load on your computer’s graphics processing. Although the plug-in appears to be a standard one, (to quote Elektron’s superb support), ”There is a lot going on under the hood that differs between DAWs, computer OS and computer hardware.” As a result, Overbridge needs a tight integration between software and hardware, which means that a fairly new computer with updated OS is required to run the program to its full potential. In my case, during the review I had an issue with displaying the waveforms on the Overbridge plug-in control panel on my mid-2011 MacBook Air and iMac (running MacOS 10.12 and 10.11 respectively), although my 2009 Windows 7 HP Laptop worked perfectly. Elektron support told me that Apple’s revisions in hardware and software have made it hard for them to support Overbridge on older Macs, and that it was likely that my problems were caused by incompatibilities between the program and either the USB chipsets, processors or hardware in my old Macs. With my HP laptop, I simply got lucky. If the plug-in aspect of the Analog Heat is important to you and you’ve got an older Mac or Windows computer, I’d advise you to check that it can run Overbridge successfully. Otherwise, you could always follow Elektron’s advice that the Overbridge experience is best on more up-to-date computer hardware — which is what I’ll probably do in the very near future. To my mind, the Analog Heat is the most inspiring piece of audio processing hardware that I have had the pleasure to get hands-on with in recent times. It is hard to overstate just how good the Analog Heat is. It’s the only audio processor I can think of that is almost as much of a musical instrument as it is an audio processor. Check out the Analog Heat’s interactive demo and sound samples on Elektron’s web site, and you’ll hear just what I mean by that. Whether I was trying a subtle bit of mastering enhancement on a stereo mix, mashing a drum bus into oblivion or triggering filter sweeps on a backing track from a rhythmic fingerstyle guitar part, the Analog Heat always felt an organic part of the process. The ease with which the envelope generator and the LFO can be tailored precisely for, and integrated into, a performance makes the Analog Heat extremely inspiring to play through and I doubt that this particular unit will make it back to Sweden. The graphical issues with Overbridge on older machines may irritate some potential users, but perhaps nowadays we have to accept the pace of change and that the latest generations of software that give us such creative freedom come at the cost of fairly regular hardware upgrades. Capable of mastering-grade audio performance. Eight levels of distortion, from clean boost to mayhem. Envelope and LFO can be routed to a wide range of modulation destinations. 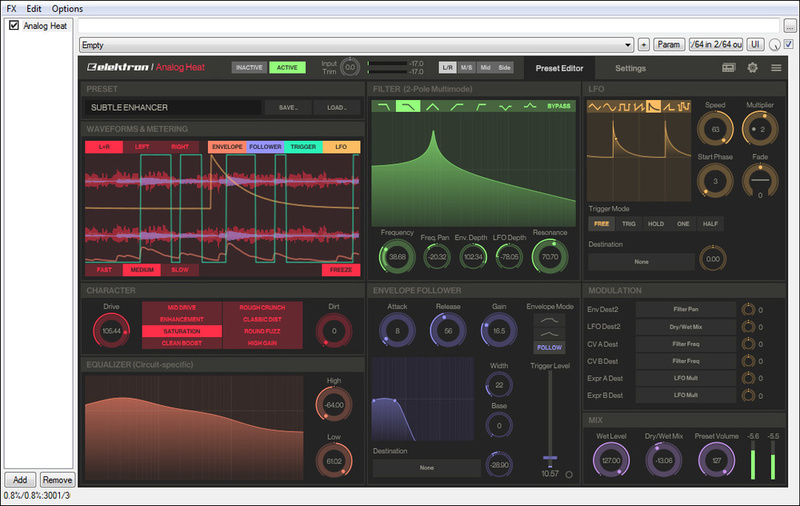 Can act as an audio interface and DAW plug-in. You’ll probably want more than one! A unique combination of distortion processor, envelope generator, filter, EQ and LFO, the Analog Heat is as capable of enhancing a mastering session as it is of crushing a drum kit into submission. It is unfailingly musical, inspirational and sensational.